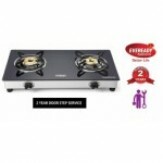 Amazon India selling Eveready GS TGC2B Stainless Steel 2 Burner Glass-Top Gas Stove, Black Rs.1899 at lowest and best price . You can follow the below steps to buy this product at their deal price.Keep Visiting dealsheaven.in for more Best offers ,hot online deals, promo code, coupons and discount . How to buy Eveready GS TGC2B Stainless Steel 2 Burner Glass-Top Gas Stove, Black?